Well, I wrote yesterday about my car troubles. Thankfully, it was only the battery. Goodness a battery for my car is expensive!!! $170!!! Oh well, it has a new battery and I won’t get stranded again like I did yesterday. On Day #2’s blog, I wrote about my mileage for the month being upped to 132. That is incorrect. I added it up again the other day and it was 135. Then, I remembered I had forgotten to include the Run With The Heroes 5K…so, the total minimum miles for September is officially 138.1. WOW!!! That’s amazing! And believe me, I’m up for the challenge. I do have to say that thinking about doing 14 miles tomorrow is intimidating. It shouldn’t be. It’s only .7 of a mile longer than my current longest run of 13.3 miles. And tomorrow’s run will be easy. No down and back on the trail extension. It’ll be 2 loops. One loop of the whole thing (10.2 miles) and then a second loop of Mopac to S. 1st street (4.15 miles). So, I will either have a 1/3 of a mile walk at the end, or a little more than 14 miles. Most likely, it will be the latter. I don’t really like walking something that I could be running. It just seems like a waste to me…Hahaha. Alright, on to today’s successes. First, I ate my waffles with PB2 and a banana for breakfast. 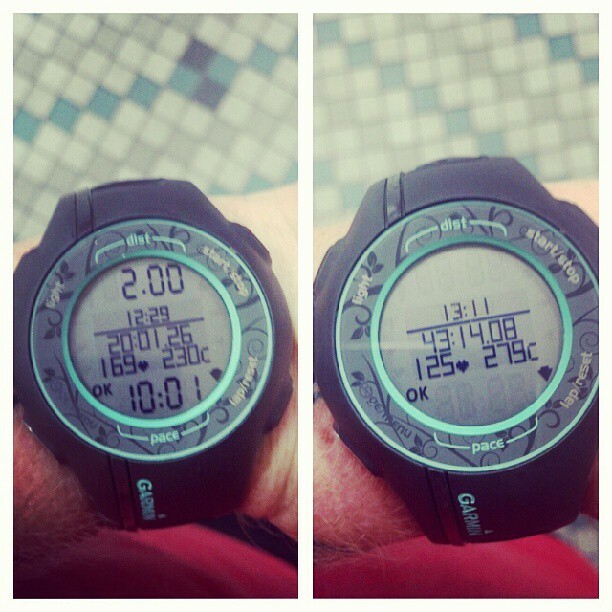 Then, I headed to the gym to do a 2 mile run and then my 3x12 strength training workout. Frankly, I thought I would burn more calories during my gym workout considering it took me over twice as long to complete (around 48 minutes) than the 2x4's did last week (around 23 minutes). I had some technical difficulties. I think the battery died on my heartrate monitor's transmitter (I just replaced the dang thing like 3 or 4 months ago and I have barely used it that whole time). Luckily it died during my first exercise, unfortunately that exercise was the one that would burn the most calories: squats. My heartrate monitor tracked 27 calories that I burned during my squats, so I'm guessing a total of 35 (?) for the whole thing. I'm probably off and it's more like 50 or 60 calories burned doing squats, but whatever. I'd rather underestimate what I've burned than overestimate and think I'm doing better than I actually am. So, anyway, I just used my Garmin to track my gym workout and used it on the indoor option. Worked pretty well. Like I said, I added 35 calories to the gym workout for a total of 544 calories burned today. NICE! Oh! On yesterday’s 8 mile run, I positioned my cellphone armband lower on my arm than usual because I didn’t want to get chaffing up under my arm. I noticed when I used the restroom at the wedding last night that I had a slight sunburn in the area where my armband used to always be. HAHAHAHA!!! Okay, back to today…after the gym I had to make a couple stops on my way home (thanks to the new car battery I wasn’t afraid to do this). I stopped at Sam’s Club to buy some bottled water and some bell peppers (and renew my membership). Then I went to Wal-Mart to buy a set of sheets and some batteries for my heartrate monitor transmitter. Then, I went to Vitamin Shoppe to pick up some more protein powder because I was running low. I walk in and I see these little tags on the shelves in front of the protein powder I buy. They say “buy 1 get 1 50% off” all Vitamin Shoppe brand products (including the BodyTech brand protein powder I buy!!!). So, I grabbed a chocolate and a banana cream one! I’m going to go through my vitamins later today and see which ones are running low, then, later this week, I’ll go back, buy at least 2 more things of protein powder and whatever vitamins I need. After I got home, I mixed and drank my protein powder with almond milk. I took my shower and then headed back out for a couple more errands. I need to do a little more grocery shopping for the week (0% plain Greek yogurt, stuffed bell pepper supplies, almond milk, frozen fruit). When I got back home, I started on my weekly cleaning. So happy to get the floors vacuumed. I felt like such a slob this past week with only vacuuming a couple times because of poor time management and planning and then not having enough time before leaving for work to vacuum. While out running the last few errands I needed to run, I stopped and got myself those fajitas I was thinking about. Ugh. Mistake. I was so over-full it wasn’t funny. And I didn’t even eat all the food they brought me! Most of what I didn’t eat was the Romanas sauce that I like to order with my fajitas at this particular restaurant (La Morelia). Honestly, while it was a splurge meal and I felt over-full when I was done eating, I don’t think I overdid it. BUT! I don’t think I’ll have any problems with food urges and cravings the rest of the week. Today’s over-full is tomorrow’s reminder to be conservative with my food. To prepare, slice an eggplant into rounds and place on a baking sheet. Mist rounds on both sides with olive oil spray, and lightly sprinkle with kosher salt. Roast in oven at 400 degrees for 20 minutes. 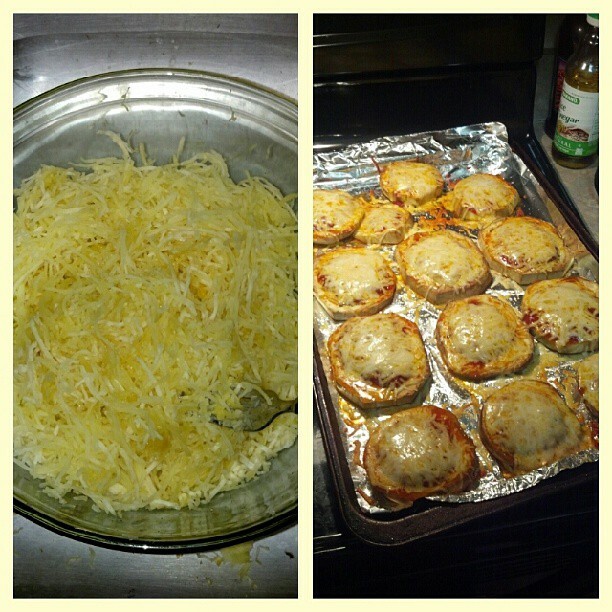 Then, top each roasted eggplant slice with marinara sauce, shredded part-skim mozzarella cheese, some grated parmesan cheese, oregano, and crushed red pepper. Pop back in the oven for about 5-10 minutes, or until the cheese is hot and bubbly. So, so good. · Preheat oven to 350 degrees F (175 degrees C). Lightly grease a baking sheet. · Place spaghetti squash cut sides down on the prepared baking sheet, and bake 30 minutes in the preheated oven, or until a sharp knife can be inserted with only a little resistance. Remove squash from oven, and set aside to cool enough to be easily handled.